And I'll upvote most of your memes but if you don't get me what I want with in a week the upvotes are gone. Yeah and it still looks good for the meme. Thx so u wanna do business? Ok so Italian trio right? Yep and if you could ocasionally toss in a Spamano or gerita pic that’ll be fine as well. If you find any 2p images those are fine as well. And the payment shall be Canada and America? Got it thx for dealin with Masq_! Can you tell me the video name please so I can look it up? 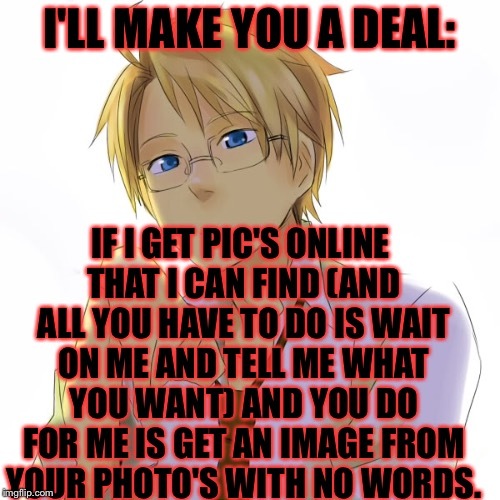 I'LL MAKE YOU A DEAL:; IF I GET PIC'S ONLINE THAT I CAN FIND (AND ALL YOU HAVE TO DO IS WAIT ON ME AND TELL ME WHAT YOU WANT) AND YOU DO FOR ME IS GET AN IMAGE FROM YOUR PHOTO'S WITH NO WORDS.